Cruising around today in the gorgeous west coast weather couldn't help but make me long for spring to make its arrival in NYC. New Yorkers yearn for nice weather so much so that when it finally arrives, there is never a need to be indoors. But when you do eventually peel yourself off your picnic blanket in the park, or come home from afternoon brunch at a quaint sidewalk cafe, you want to continue your spring love affair indoors. 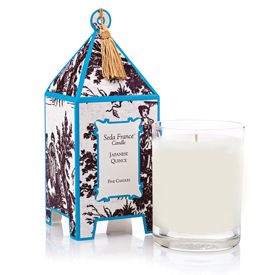 Though this Seda France Japanese Quince candle is one that I could burn all year round, it is the perfect way to introduce spring into your home. I first stumbled upon this elegant brand while getting a facial at my favorite spa. The soothing and pristine atmosphere of the spa came alive with this glorious, sweet scent that was wafting through the halls. Almost immediately after my appointment, I found the nearest store and picked up this cult classic. Where had I been that I had not heard of this must have delight?! The beautiful pagoda box packaging made it even more special - as if I was gifting it to myself. Since then I have spread the love, gifting to friends and family, confidently knowing that no one can resist this intoxicating scent of rhubarb, passion fruit, white fleshed peach with a hint of white jasmine petals. The weather in NYC may still feel like winter, but my home will have the scent of spring.